Composition: Miconazole nitrate 20 g/L, chlorhexidine gluconate 20 g/L. Actions: Antifungal effect against Malassezia , and a potent activity against bacteria. Chlorhexidine has a broad spectrum of activity against bacteria, yeasts, moulds and fungi. The combination of miconazole and chlorhexidine is efficacious at killing the organisms of seborrhoeic dermatitis,and Staphylococcus intermedius. Staph. intermedius occurs as an overgrowth pathogen in the presence of Malassezia and is the main bacterial species responsible for bacterial dermatitis in the dog and cat. Indications: Treatment of seborrhoeic dermatitis associated with Staphylococcus intermedius and Malassezia; aids in the treatment of ringworm Malaseb can alter the effectivness of top spot flea treatments. Directions: Will irritate the eyes and skin. Avoid contact with eyes and skin. When using the product wear rubber gloves. If product in eyes wash out immediately with water. Wash hands after use. Directions for use: Wet the animal thoroughly with clean water. Apply the foam to the animal at several points and massage into the coat. A sponge assists lathering and penetration of the coat. 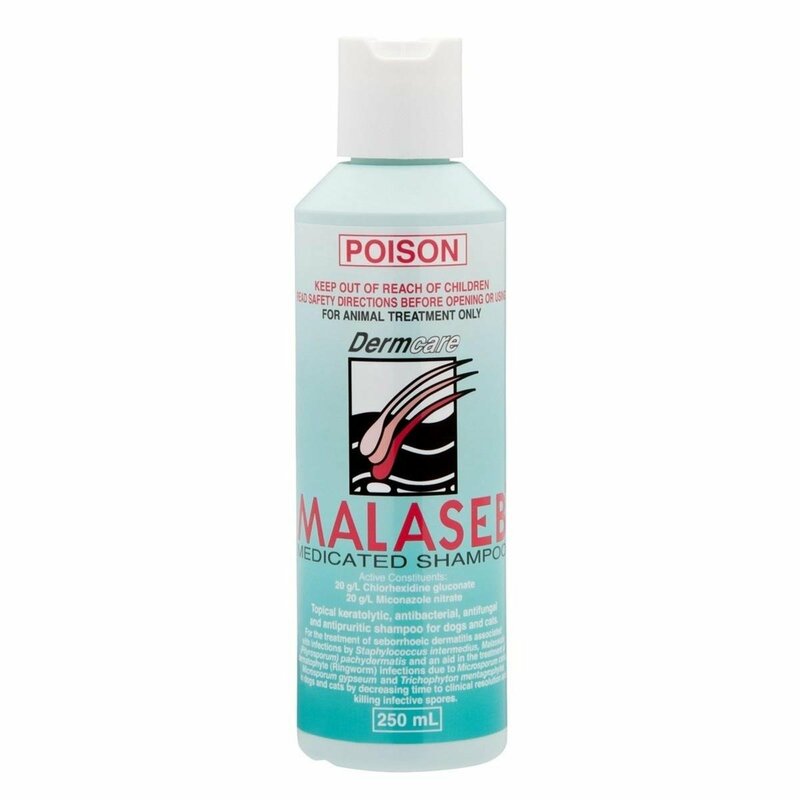 Ensure that Malaseb is applied around the lips, under the tail and between the toes as these areas harbour causative organisms. Allow to stand for ten minutes, then rinse off with clean water. Repeat twice weekly until symptoms abate then use weekly, or on veterinary advice. With ringworm all in-contact animals should be treated to limit infection spreading and environmental contamination.